Yes, another one of those. 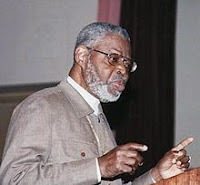 Dr. Ben is considered one of the more notable – read that as “notorious” – Afrocentric scholars, one of those who take an Afrocentric perspective on history (which in itself is not silly, mind) to justify all sorts of desperate pseudoscience and conspiracy theories. Dr. Ben began teaching Egyptology at Malcolm King College in the 70s, and subsequently at City College in New York City and as an adjunct professor at Cornell. He is the author of numerous books, primarily on ancient Nile Valley civilizations and their perceived impacts on Western cultures, where he argues that the original Jews were from Ethiopia and were Black Africans (Moses was black, for instance), while the white Jews later stole the Jewish faith and its customs. Evidence? Primarily existence of a conspiracy to suppress the truth about black supremacy, it seems. To give an example of his “scholarship”: When European classics professor Mary Lefkowitz publicly confronted Ben-Jochannan about e.g. his claims that Aristotle stole his ideas from the Library of Alexandria, which black Africans used to collect their philosophical works: “how would that have been possible, when the library was not built until after his death?” Ben-Jochannan by telling those present that “they could and should believe what black instructors told them,” the audience accused Lefkowitz of racism, and concluded “that although they might think that Jews were all ‘hook-nosed and sallow faced,’ there were other Jews [back then] who looked like himself.” His works are riddled with inaccuracies, confusions and made-up stories like these, primarily because Dr. Ben doesn’t care about the facts as long as they serve his narrative. Diagnosis: The pseudoscience that is promulgated under the heading of “afrocentrism” by people like Dr. Ben is rather disconcerting – and unfortunate (Molefi Kete Asante’s original point of reclaiming the narrative in his 1980 book is not silly, for instance). Yet, Dr. Ben’s myths and silliness seem, sadly, to have had quite a bit of impact. Update: He actually passed away March this year. Good riddance to an embarrassment to the human family.